Did you ever farm for a certain item so much that, even when you got to the point when you knew you probably wouldn’t use it much anyway, you still wanted it desperately just as a matter of principle? I’ve done that a few times. I remember waiting… and waiting… and waiting… and waiting some more as I ran Tower of Despair until I could recite the dialogue from memory, and still not getting a Band of Siberys. Even on multiple-of-20 completions runs, I’d eagerly check my end reward list only to be disappointed – seemed I had my pick of EVERY damned ring EXCEPT the one I wanted. Finally got it in Horoth’s chest on Even’s 80-something completion. Then there was my seemingly endless quest for a Shard of the Silver Slinger. I thought I’d never get it. I wondered if it existed at all. So I blogged about it, and within a week, I finally pulled it. For months now I’ve been running EE Legend of Two-Toed Tobias, mostly solo, sometimes with a guildie or friend or piker or two, looking for the Cursed Blade of Jack Jibbers. I’ve heard other people say they have it. (I’m lookin’ at YOU, Tholgrin…) Some guy in Even’s EE FoT group tonight claimed to have one – or at least that’s what he said about the third time Even tossed him a rez. These people LIE. They are DIRTY DIRTY LIARS with DIRTY DIRTY PANTS ON FIRE. Because I’m convinced that the Cursed Blade of Jack Jibbers DOES NOT EXIST. If it did, I would have seen one by now. 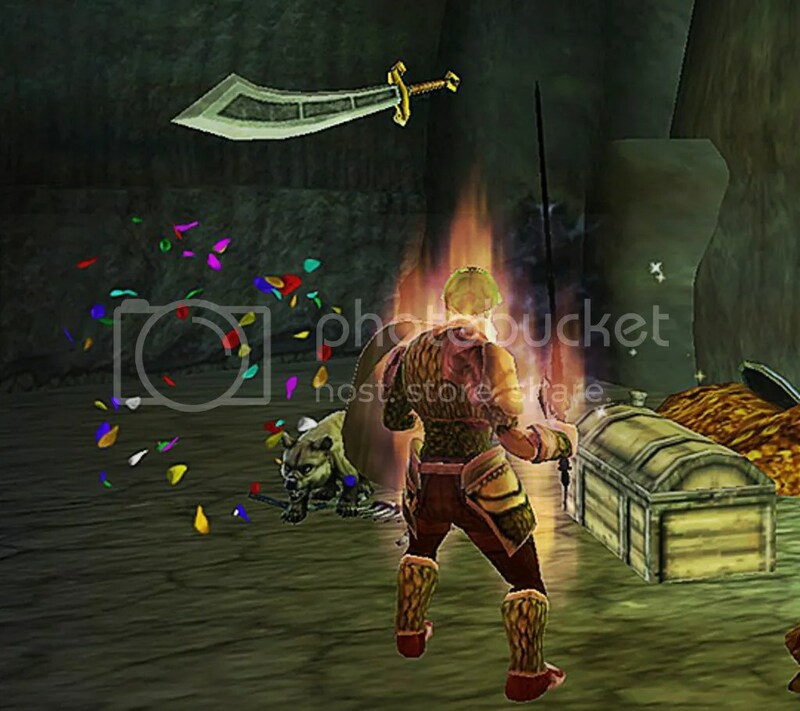 But the closest I’ve come, as you can see in the screenshot above, is immediately after killing* Jack, when his blade dangles tantalizingly over your head, making you feel like Damocles (“That ain’t no crime…” – cookie if you get the reference) and remaining juuuuuuust out of reach. * – Since Jack Jibbers is undead, is “kill” the proper verb here? “Unkill,” maybe? Anyway. In hopes that, as with the Silver Slinger shard, the loot gods will see this blog and respond accordingly, I’m hoping that posting this will result in a Jibbers blade for Even within a week. This past Sunday’s livestream featured Even and Gonari duoing the epic elite Sschindylryn chain. Keava couldn’t join in, as he was splitting his time between work and leveling up his newly-TRed warlock… maybe that’s why this week, while there were certainly some laughs, nobody tried to grab Elminster’s thingie, or offered their Pale Rod to anyone, or told everyone to stop beating up Draya Dun’Robar so we could check and see if the Drow commander was male or female. Must work on that! Next week’s livestream will probably be EE Demonweb. DRETCHES! Yay! You can watch live at 11 pm Eastern time on Sunday by visiting my Twitch channel. 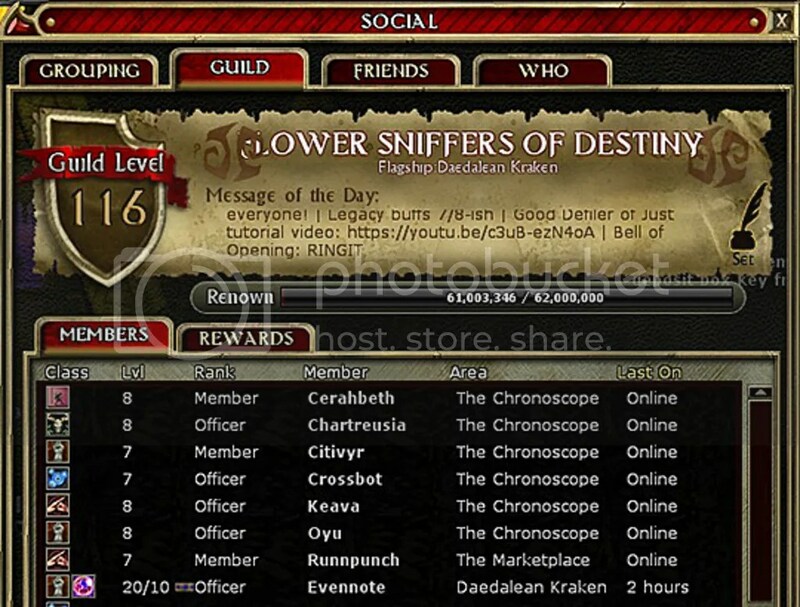 ‘Twas a super fun run that went amazingly well – elite Chrono at level can be a bit dicey, especially with a first-timer, a transplant from another server with no gear, and two members who haven’t played much DDO in quite a while… not to mention five PuGgers of unknown origin. But I’m pretty sure we had only three or four deaths total, which was less than the number of Hellfire Crossbows that dropped and weren’t wanted by anyone! Hopefully this Friday we’ll get another good Flower Sniffin’ turnout for guild night. Hmmm… I’m not normally much into PvP, but a guild one might be fun. I might even stream that! Sundays at 11 pm Eastern has been working out quite well as a livestreaming slot for me. Still waiting to be added to the official schedule – maybe “soon*” ™? Senseless violence, though… different story there. Was about to go to bed Friday night when I saw a headline that former “The Voice” contestant Christina Grimmie had been shot by a fan and was in critical condition. She never got the chance to tweet again. She was signing autographs after the show when a man walked up to her and shot her. Just like that. I stayed up that night waiting for news of her condition. Unfortunately, when word finally came, it wasn’t good. Bright, talented, 22 years old… gone. Just like that. No reason. Incredibly freaking sad. And just one night later, a shooting spree in a nightclub, also in Orlando. Fifty people dead. More than that injured. Because some douchebag thought he had the right to kill people who didn’t love the way he thought they should. It touched a nerve for me. My best friend is gay; I’m going to her wedding in July. My brother is gay. Some of the people I care about most are gay or bi. I am having a lot of trouble wrapping my head around the fact that there are people who want to kill them – KILL THEM – for being who they are. And I simply cannot understand why so many Americans vehemently, even violently, oppose any form of gun control. But this is supposed to be a blog about DDO, not a soapbox. So I’ll get to that in a minute. First, though… be kind to each other. Cut the negative people out of your life and focus on the ones who make you laugh, who inspire you, who support you, who love you. Appreciate them. Cherish them. 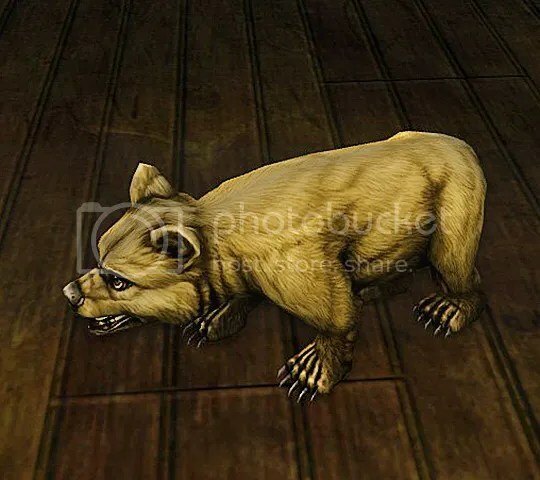 So after everything that went on, it was a good feeling to log into DDO Sunday night, fire up the livestream, grab Keava and Slvr, and laugh our way through the Eveningstar chain. Slvr and I were over level, but SAGAS. I probably should’ve brought someone other than Even since Even can cruise through that stuff solo, but Even was who I wanted to play. She’s the one who’s the most like real-life me, and sometimes that matters. Sunday’s run was just what I needed. In between liberating the Midlers (or are they the Milders? C’mon, DDO, a little consistency! ), ridding Eveningstar of evil necromancers, leading Ana around (she wandered off and got lost once – maybe she needs some Bigby’s Guiding Hands), lighting bonfires, and comparing giant bebeliths to Herb Tarlek’s top account on “WKRP in Cincinnati” (yeah, you’re gonna have to watch the vid if you want to know about that one), we had a running gag about Elminster’s… thingie. So even a night later, we were still laughing about that. And then Keava opened a chest and asked if anyone wanted a Pale Rod… yeah, I think that probably deserves a Button of Winning!